As the Thanksgiving holiday approaches, and the focus is often on cooking a fancy meal, don't neglect some Thanksgiving activities for kids. Children can take part in making the holiday more festive for everyone. These activities don't have to wait until Thanksgiving day; they can be enjoyed the whole month of November. Whether it be games, crafts, cooking or baking, your child will enjoy these Thanksgiving activities. Some assistance may be needed; adults or older kids can help the younger ones. Thanksgiving games can be fun for the whole family. How to play: Divide the children into two teams. 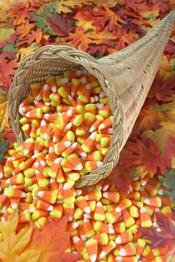 Place two plastic bowls of candy corn at one end of the room and at the other, two other bowls. The idea is to take a piece of candy corn from the first bowl and carry it in a spoon to the empty bowl at the end of the race. Rush back to your team's line, and give the spoon to the next child so he can take out a piece of candy corn, place it on the spoon, and run with it to the other bowl. The first team to get all their candy corn pieces on the spoon into the bowl, wins. This game is both a craft and a game. How to play: On index cards, have children draw pictures of turkeys and color them. To make it more fun, they can add stickers of autumn leaves, pumpkins or jack-o'-lanterns to their artwork. Next, either a parent or older child can hide the cards around some rooms in the house. After hiding the cards, the other children will set out to find them. The child who finds the most cards is the winner. Children can take turns hiding the cards and searching for them. Did you know turkeys often fall asleep in trees? Were you aware turkeys can also be victims of heart attacks while living under loud air force fields? Many turkeys have been found dead on the scene after witnessing jet take-off and landing. These fun turkey facts are sure to delight even your youngest of guests. 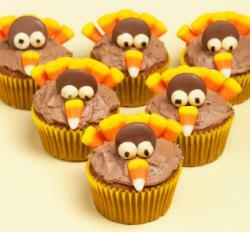 For more turkey trivia, visit thefun-filled, Brownie Locks' Thanksgiving Trivia site. You can download and print trivia facts and cut them into small scraps. Fill a hollowed out pumpkin or gourd with the trivia questions, and pass it around the table for a healthy dose of the giggles! Decorating cookies with fall colors and shapes is a wonderful activity for children. Using a basic cookie recipe, form the dough into shapes with either your hands or cookie cutters. Sprinkle the shapes with colored sugar. Sugar can be colored by placing a drop of food coloring (any color) into a container with a few tablespoons of white sugar. Mix the food coloring and sugar together well and spoon over cookies. Make a batch of cupcakes and decorate them with sprinkles, colored sugar, or orange candy pumpkins. Have a contest to see which cupcake is the most unique, yummy-looking, and festive. Crafts are a creative, fun way to celebrate the holiday. What to do: Even preschoolers can sit down with some crayons or colored pencils and draw on either white blank or colored index cards. Have them draw or trace pumpkins or autumn leaves. 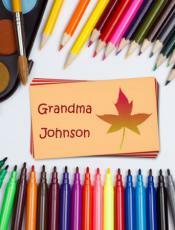 An older child can write the name of one of the dinner guests on each card. This way everyone will have a name card and know where to sit at the Thanksgiving meal. For those who enjoy painting, using watercolors to create the cards can be nice, too. What to do: Cut a tree from brown foam and leaves from an assortment of colored foam, using a store-bought pattern or one you create. Have the children decorate the leaves with markers. Have each child write something he or she is thankful for on a leaf. Preschoolers may need the help of an older child or adult for this part. Glue each leaf onto the tree. Glue the tree onto either a square piece of blue foam or a piece of blue construction paper. The tree looks like it is standing in front of a crisp, blue sky. Place the artwork on the refrigerator for all to see or use it as a centerpiece on your Thanksgiving table. What you need: Collect sturdy and unbroken pine cones from your yard, a friend's, or when you take a walk in a park. Purchase some decorative sequins or colorful glitter at a craft store. You will need glue, like Elmer's. What to do: Make sure each pine cone is free from needles, debris and that it is dry. 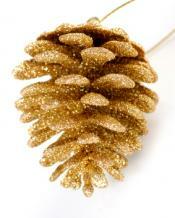 Using glue, stick the sequins onto the pine cone to form a pretty piece of art. Glue some glitter over the top of the cone. Use the pine cones as part of the table's centerpiece or place lots of the pine cones in a basket to set by the fireplace. You can add two dark circles using raisins, or circles of paper for eyes. Glue a triangular piece of brown colored paper (the beak) to the creation. Now the cone looks like a turkey with eyes and a beak. What you need: Set up a small card table. Cover it in brown craft paper and set out crayons. What to do: Set the kids at the table with a variety of stencils and Thanksgiving themed stickers. 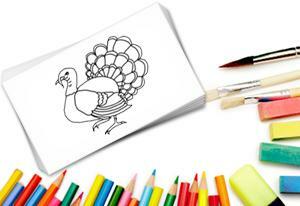 For a competitive group of kids, why not hold a turkey drawing contest? The adults can judge the finished pictures and choose a Turkey winner. Perhaps the winner will receive a special treat that's been thoughtfully set aside? Get creative and stock up on various mediums such as paints, chalk and coloring pencils to keep kids inspired for hours on end. Line a card table with craft paper and fill buckets with scissors, glue, construction paper scraps and a bundle of self-stick google eyes. Let kids get creative and build their own turkeys, Indians or Pilgrims! Keep felts squares and pipe cleaners handy for advanced Thanksgiving kids crafts. Print coloring pages from the Internet and give them to younger children to color. Crafts for Thanksgiving, a book by Kathy Ross, will give you even more ideas for Thanksgiving fun. Find some puzzles and mazes online. Print them out for your child to solve and color. They are available for all different levels and skills. On Thanksgiving day, before you eat, take turns around the table, having each person say what he or she is especially thankful for. Let the kids play; even the younger ones will come up with something. Count your blessings!